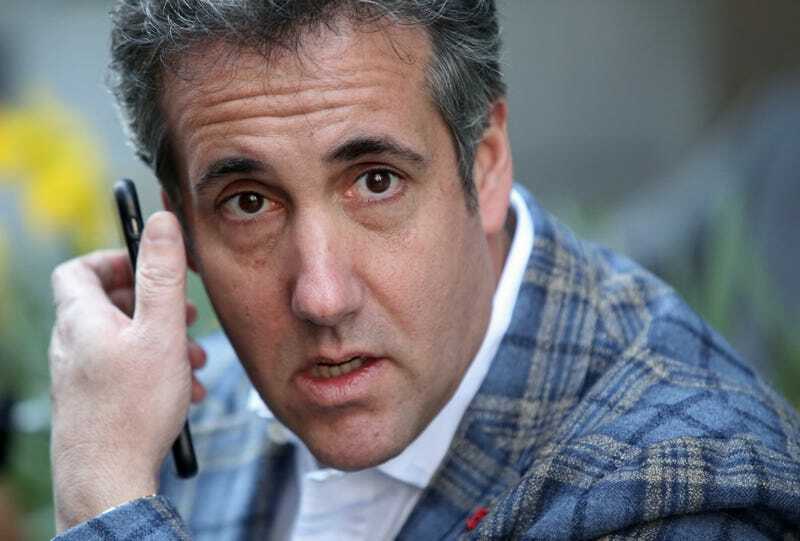 Michael Cohen, President Donald Trump’s personal attorney, takes a call near the Loews Regency hotel in New York City on April 13, 2018. Whenever anyone asks, “Isn’t it funny how ... ,” they are usually accusing someone of something without explicitly saying it. For instance: Isn’t it funny how your boyfriend always needs to go to the other room when he receives late-night texts? Isn’t it funny how we’ve never seen Sarah Huckabee Sanders in the same room with SpongeBob’s best friend, Patrick Star? Isn’t it funny how Tucker Carlson has never denied that he has a white robe and a matching pointed hood? I would never accuse your boyfriend of cheating or Carlson of being a member of the Ku Klux Klan. Nor do I think that Sarah Sanders has a friend who lives in a pineapple under the sea. I just find it all so funny. Here’s another example: Don’t you find it funny that AT&T paid Michael Cohen’s shell company, Essential Consultants, $50,000 per month for all of 2017? Even though the $600,000 is 3.5 percent of all the money the huge corporation spends on lobbying, AT&T said Essential Consultants “did no legal or lobbying work for us, and the contract ended in December 2017,” according to the Washington Post. Now, we know that Cohen is not a lobbyist, and he only had three clients, one of whom was Donald Trump. We also know that AT&T, as the No. 1 internet provider in the U.S., had a vested interest in dismantling net neutrality because the company stood to make a fortune if the regulations were nixed. Now, I’m not accusing AT&T of bribing anyone, but I find it funny that the telecom behemoth began paying the money to Trump’s fixer, Cohen, the not-lobbyist, two months after AT&T announced that it would try to merge with Time Warner, the second-largest internet provider in America. Again, I’m not trying to start anything, but Cohen, Trump’s fixer, who, AT&T said, did nothing for the company, began receiving these payments in January 2017, the month Trump took office. Now, it’s probably a hilarious coincidence that January 2017 was also the same month that Trump nominated Ajit Pai to head the Federal Communications Commission. Nothing’s wrong with that, even though it made me giggle when I learned that Pai worked for the telecom industry before becoming a member of the FCC. The fact that Pai was loudly against net neutrality, pro-deregulation and vocally pro-big business is sidesplittingly funny. Pai wants to "fire up the weed whacker" and cut down FCC regulations. But didn’t they just say Cohen did nothing? Wouldn’t it be hilarious if all of this happened in the same month that Ajit Pai was confirmed? Wouldn’t it make you double over in laughter if this happened the month Trump took office? You know what would be funnier? It would be hilarious if all of this took place soon after Michael Cohen and Randall Stephenson, AT&T’s CEO, were seen visiting Trump Tower the same day. Well, Stephenson and Cohen both happened to visit Trump at Trump Tower in New York City on Jan. 12, 2017. On Saturday, Jan. 20, 2017, Donald J. Trump became the 45th president of the United States. On Monday, Jan. 22, 2017, in one of the first official acts of the Trump administration, Ajit Pai was nominated to be chairman of the FCC.